Our chiropractor Dr. Brian Dittmann serves Clinton and the surrounding area. 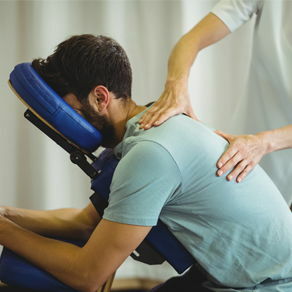 Our professional and experienced team at Clinton Chiropractic Clinic is committed to address your unique needs with our chiropractic solutions. Are you experiencing back or neck pain? Headaches or muscle tension? Maybe you’ve just been injured, and are searching for pain relief after an accident. Maybe you’re suffering from chronic back pain or a painful spinal condition. We want to help. Many of our patients are not injured, but simply want to improve their overall health. Come see us. Our chiropractor can help you reach your wellness goals--whatever it might be. We've helped so many of our patients achieve better health, and we want that for you too! Dr. Brian Dittman is ready to guide you through your first visit to Clinton Chiropractic Clinic. He will explain how chiropractic care works, and provide you with a full spinal and health evaluation to determine how our chiropractic solutions can best address your needs. We will then create a customized plan just for your condition and health goals. The doctor will perform a spinal manipulation/chiropractic adjustment to gently return vertebrae and discs to their original alignment. When everything is correctly aligned, muscle tension reduces, inflammation decreases and blood flow and nerve impulses are fully restored to promote healing. We offer non-surgical spinal decompression therapies for chronic back pain. This technique is very effective for herniated or degenerative discs, stenosis and facet syndrome. We also offer spine force to improve your core fitness of the spinal muscles. This therapy involves motion along all three axes of the spine. We are We are very excited to announce our new Class IV laser therapy that uses stimulating laser light to improve nerve impulse transmission. Many of our patients experience greatly reduced or eliminated pain with this treatment. We treat all kinds of neck pain, back pain and leg pain. We see many patients who've suffered automobile accidents or work injuries. We also see many patients with sports injuries, spinal stenosis, sciatica, arthritis and other back and neck injuries. If you have not been to a chiropractor before, but you want to know more or feel that it can help, contact us or call us at (608) 676-2210. Dr. Brian Dittmann and our experienced team at Clinton Chiropractic Clinic will answer all your questions. "Dr Dittman is the best he helped me a lot I could hardly walk when I first went to see him I am a c n a and do a lot of lifting i hurt my back and he helped my I wouldn't go to a one els his staff is great"
"My visit from start to finish was professional and all inclusive. The staff is knowledgeable and Dr. Brian is current on the new procedures. They sell only the necessary supplements and I never felt inclined to purchase any of their retail, even though I did - and still do!" "Last year I came to Dr. Dittmann about pain from my sacroiliac joint down my left leg. I could hardly walk or sleep. I was in pain for over a month ...thinking I could exercise my way out of it...ha! He started with adjustments for a disc problem and recommended exercises. Then he suggested adding laser treatments and it sped up my recovery amazingly. I feel great!" "After two years of dealing with the pain and, at times, hardly being able to walk even with a cane, I am pain free. I feel so bad for all the people who have back pain that have never heard about or seen the decompression machine. In just one month they could be pain free if someone would tell them of your wonderful treatment program to heal back injuries without injections or surgery of the spine. You truly were an answer to my prayers!" "The pain was unbearable from the hip down to the ankle. I heard about Dr. Dittmann and the decompression machine. Before my first visit I was unable to put one foot ahead of the other. After only three adjustments and treatments on the DRX, I was able to return to work milking cows." "When I first saw Dr. D, I could hardly walk upright. He helped me understand why I was feeling the way I did, and helped me to change the way I was living to improve my condition tremendously. He is about treating the whole patient, not just the condition." "For the past ten years I have had lower back pain off and on. The last time it happened, I couldn’t get out of bed, couldn’t put my shoes on, and had to have someone drive me to see Dr. Dittmann. After my first treatment I could really feel the difference. I had six more treatments and am pain free!" "I’ve had 2 epidurals which didn’t really help, in fact the 2nd shot left me paralyzed for a few days. Before starting Decompression I was diagnosed with a bad disc stenosis. I didn’t know if my legs would go from up under me Just getting up to walk hurt. I couldn’t stand more then 5 to 10 minutes. I got such sharp pains-it’s been at least 3 years and nothing really helped, til I saw Dr.Dittmann. Now I can sleep and walk as long as I want to. I’m doing everything I have to. I couldn’t even mop my floors or wash dishes. I can do everything now." "I was given braces for my wrists in 2012; I have been suffering from numbness in my hands for over 4 years. I haven’t been able to get a good night’s rest for several months because of the numbness in my hands. I had a needle EMG done; that had shown that I had nerve damage in my hands. I was scheduled to have carpel tunnel surgery two weeks before seeing Dr. Dittmann. After the first laser treatment I slept the best I have in several months. The change and improvement I have gotten in just a few laser treatments is amazing; I canceled the surgery and I am so relieved!" "After living with severe back and leg pain for weeks and seeking help through general physicians, pain medications, and removing myself from my typical daily activities, I decided to seek relief from Dr. Dittmann at Clinton Chiropractic Clinic. At this point I was in such severe pain I could hardly stand and was unable to lay down or sleep in bed without excruciating pain shooting down my leg. At home I was essentially living in a recliner, unable to do the things I enjoyed. After less than a month of care, I can now sleep in bed comfortably for the full night. It is hard to believe that only a few weeks ago I could hardly function, and now I am able to travel, stand, sleep, and even do back-strengthening exercises pain-free." "I was suffering from excruciating back pain for 8 months. I would have to sit down to cook, turning in bed would kill me. I would sit down often to get relief but I had sharp stabbing pains getting out of bed or a chair. I could hardly function. I saw a M.D. whom suggested I get a shot for the relief. Instead I came to Clinton Chiropractic Clinic. I went on the Decompression table along with the adjustments Dr. Dittmann gave treat me with, I was so much better in 2 weeks! I couldn’t believe it! Just one month later and I’m doing great! Thank you!" "I’ve had shots in my back and physical therapy and nothing helped. One shot made my leg worse-I suffered 2 ½ months after that- they said it would take time. Most of the time I slept sitting on a chair at the kitchen table with a pillow under my arms. I couldn’t walk I felt there in my back they said it was arthritis. I had a constant burning in my right leg. Now all I have is an ache in my back but I’m doing more then I have in a long time. Sitting too long I feel it but it’s an ache or stiffness I can walk without leaning on something or stop to sit down and rub my leg. I can walk as much as I want. I can sit more then 1 hour in a car without having to get out and stretch because the pain was so bad." "Multiple sclerosis is debilitating and incurable. I’ve heard this since I was diagnosed thirty seven years ago. Drugs helped minimize my symptoms but had side effects. That was true until last November. After adjustments by Dr. Dittmann the pain was much less my feet felt normal, and my stamina improved. Thanks to Dr. Dittmann I can be a real grandma to my grand kids. This is so amazing and wonderful." "Dr. Dittmann has been able to relieve my pain significantly; Through the use of a decompression table and adjustments. I lived everyday with back pain that eventually got to the point of ceasing my daily activities. He does more than just treat your back. He provides exercises to perform on your own to assist in your healing process, as well as an assortment of health supplements. I would recommend Clinton Chiropractic Clinic to anyone who has back pain of any kind." "I had pain in my back and down my right leg for years. I was having trouble even walking up and down stairs. I’ve had epidurals, which didn’t help much, and the last one was very painful. I started my mornings off with pain medication, the more I tried to do the worse I felt. Nothing had helped until I saw Dr. Dittmann and used his decompression table. Now I’m sleeping really well I never wake up due to back pain and I can do things I want to do again." "I had surgery several years ago for sciatica but have had pain for years after that. I couldn’t stand for more than 2-3 minutes without increasing pain. I would stay at home most of the time because of the pain. I would have to change positions frequently, I had to hold on to something to stand and I could only walk a short distance. Since I started treatments with Dr. Dittmann, I have very little if any back pain. I am cooking, I am able to stand longer without having to ret, and I do not always have to change positions to get comfortable. It is just so nice to be without pain." "I have been bed ridden for a couple of years, battling a brain tumor and cancer. Because of pain in my knees and back I haven’t been able to do anything. I can hardly walk. After just a few short weeks of care I’m cooking, walking and even a little cleaning. I can do so much more with much less pain now. I have a ways to go but with dietary changes and exercises that Dr. Dittmann has given me, I am confident I can be like my old self again. I cooked dinner 2 nights in a row which I haven’t been able to do in 2 years." "I suffered for over 2 years with severe debilitating back pain. My MRI showed multiple disc bulges, the specialist said he wanted to replace 3 of my discs. I couldn’t function without Vicodin constantly in my system. Even with the drugs I hurt all the time. If I were to go without them I would hurt so badly I would feel like I would throw up. I tried Epidurals, Physical Therapy, everything, and nothing helped. Two weeks after starting treatments here I was taking only one pain pill. I couldn’t believe the changes. I felt so much better. Today I feel 95%better. I’m not taking any pain drugs." "First I went to the medical doctor; I had to use a wheelchair to get around his office. I was too sore and weak to walk. I was prescribed pain pills. I pretty much couldn’t do anything but lay on the couch. I couldn’t sleep in bed. I couldn’t walk without the use of a cane. After 4 weeks of care with Dr Dittmann, I am sleeping all night in my bed, I’m off all pain meds, I’m able to cut my grass, take out the garbage, wash dishes and other chores I could never do before. I haven’t used my cane in weeks; Now with the exercises Dr Dittmann showed me I ‘m getting stronger everyday!" "I injured my right shoulder, I couldn’t raise my arm above my head or reach behind my back to remove my wallet out of my right pocket. I could feel the difference about the 6th laser treatment. It keeps feeling better each visit and around the 8th and 9th treatment my arm is more flexible and I can reach above my head and I can remove my wallet from my rear pocket, and my neck in finally flexible. I have been getting better every visit."